Christmas is just around the corner and right about now everyone is finishing up their Christmas shopping and getting ready for the holidays. Over in the North Pole we expect Santa Claus is getting ready too — he’s loading up his sleigh for the huge feat of delivering presents to all the boys and girls throughout the world. But how does Santa deliver all of these presents in just one day? Luckily, an analysis from Treetopia was share with us, which took a look at some of the numbers behind his holly jolly “job” this holiday season. Did you know that Santa has to travel to 195 countries delivering 7.7 billion presents to over 1.5 billion homes? That’s a lot miles to travel and stops to make so you can imagine Santa has to fly pretty fast. To make those deliveries in time so that everyone has a present to open on Christmas Day, Santa has to travel at a speed of 93,000 miles per second which is half the speed of light! At this speed Santa can travel the 6,880,123 miles needed to deliver each present to every house worldwide in just 2 hours and 3 minutes. If Santa’s sleigh was in the shop however and he had to use regular transportation, using a Boeing C-17 Globemaster airplane with a top speed of 518 mph it would take Santa over 90,000 trips just to deliver every present! So, So, So Many Calories! Santa really does eat a lot and during his Christmas delivery he eats a belly busting 3.1 billion cookies and drinks an eye watering 1.5 billion glasses of milk consuming a total of 520 million calories in just one day! With that many calories Santa will need to exercise if he wants to be able to fit down the chimney for next year. Hopefully the North Pole has some exercise classes — a New Year’s resolution for him perhaps? Burning off 520 million calories is a difficult task for anyone, some would say impossible even but luckily Santa is magical. If Santa wasn’t magical though it would be an impossible task to burn those calories! 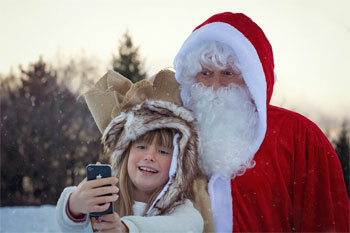 If Santa chose to go for a jog to burn these calories off it would take him 47,033 years at a pace of 6 mph! If Santa chose to go for a bike ride instead it would take him 59,989 year cycling at 12 mph, that’s a lot of peddling. So when you’re relaxing over the holidays, remember to spare a thought for Santa. And if you’d like to help make his trip a little less unhealthy, then consider leaving something other than cookies. And hey, that just means you can keep the cookies for yourself.